Join the industry's leading Procure-to-Pay platform. Control your purchasing. Automate your Accounts Payable. Increase your bottom-line. A Comprehensive Spend Management Solution. Easy-to-Use, collaborative, hosted, and built specifically for the cinema industry. Those are the driving characteristics that make Cinema Solutions the clear choice for your purchasing management needs. Adds structure and distributes the workload so your workforce is efficient and compliant. Cinema Solutions automates the entire A/P invoice process by utilizing built-in rules to automate the cycle from collection, to presentation, to payment. Cinema Solutions keeps track of your inventory levels and inventory cost, across your entire organization, by seamlessly integrating with your purchasing, receiving, and sales. Know the health of your procurement activities through your Cinema Solutions Interactive dashboard. Track expenditures by budget and know in real-time where your organization stands in terms of budgeted versus actual. 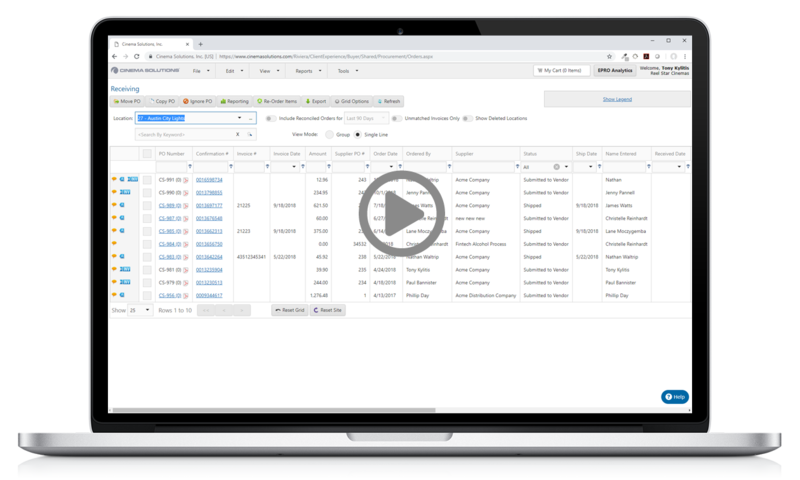 Add extra effiencies to the Procure-to-Pay workflow by paying invoices electronically from Cinema Solutions with our integrated payment module. Cinema Solutions automates traditional procurement processes to help companies dramatically reduce maverick spend, enhance spend visibility, increase purchasing control, enforce security and compliance, and improve cost savings. Buyers are able to make faster, more accurate decisions and reduce procurement costs by 20% of total spend within the first year. Buyers are looking for more than just a company to sell them product. They are looking for true business partners; that is, suppliers that are willing to align with their customer’s objectives and work with them on all aspects of the business relationship, including the business processes. Contact us today to join the industry's leading Supplier Network. Cinema Solutions, an affiliate of ReactorNet Technologies, is an industry leading software company specializing in enterprise level spend management solutions for buyers and suppliers in the cinema industry. The company’s cloud-based software is offered as a subscription, acting as a procure-to-pay platform that allows buyers to gain control of their spending while at the same time collaborating directly with their suppliers. Founded in 2000, Cinema Solutions is a privately held company headquartered in San Antonio, Texas. Together with ReactorNet, clients include AMC Theatres, Cinemark Theatres, Aimbridge Hospitality, and Foodbuy, LLC (a division of Compass Group North America). For technical support, please login and use the Help Center to request assistance. ©2019 Cinema Solution, Inc. All rights reserved.